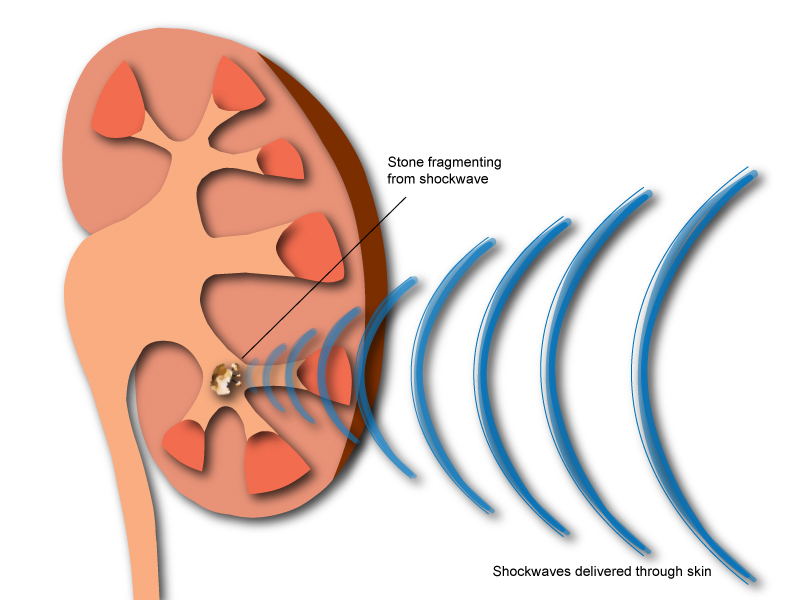 For certain kidney stones — depending on size and location — your doctor may recommend a procedure called extracorporeal shock wave lithotripsy (ESWL). ESWL uses sound waves to create strong vibrations (shock waves) that break the stones into tiny pieces that can be passed in your urine. The procedure lasts about 45 to 60 minutes and can cause moderate pain, so you may be under sedation or light anesthesia to make you comfortable. ESWL can cause blood in the urine, bruising on the back or abdomen, bleeding around the kidney and other adjacent organs, and discomfort as the stone fragments pass through the urinary tract. When can ESWL be used? ESWL works better with some stones than others. Very large stones cannot be treated this way. The size and shape of stone, where it is lodged in your urinary tract, your health, and your kidneys’ health will be part of the decision to use it. Stones that are smaller than 2 cm in diameter are the best size for ESWL. The treatment might not be effective in very large ones. SWL is more appropriate for some people than others. Because x-rays and shock waves are needed in ESWL, pregnant women with stones are not treated this way. People with bleeding disorders, infections, severe skeletal abnormalities, or who are morbidly obese also not usually good candidates for ESWL. lf your kidneys have other abnormalities, your doctor may decide you should have a different treatment. lf you have a cardiac pacemaker, a cardiologist will decide if you can have ESWL. Is it urgent that the patient be treated with a procedure like this? lf the stone does not pass on its own, it will require treatment. lf you have an infection, severe pain, or if your kidney function is threatened, your doctors will act quickly. lf you only have one kidney or have had a kidney transplant, your stone will be treated more quickly. lf you have large stones or stones in both kidneys, your doctors will not wait to treat you. You will be positioned on an operating table. A soft, water-filled cushion may be placed on your abdomen or behind your kidney. The body is positioned so that the stone can be targeted precisely with the shock wave. In an older method, the patient is placed in a tub of lukewarm water. About 1-2 thousand shock waves are needed to crush the stones. The complete treatment takes about 45 to 60 minutes. Sometimes, doctors insert a tube via the bladder and thread it up to the kidney just prior to ESWL. These tubes (called stents) are used when the ureter is blocked, when there is a risk of infection and in patients with intolerable pain or reduced kidney function. After the procedure, you will usually stay for about an hour then be allowed to return home if all goes well. You will be asked to drink plenty of liquid, strain your urine through a filter to capture the stone pieces for testing, and you may need to take antibiotics and painkillers. Some studies have reported stones may come out better if certain drugs (calcium antagonists or alpha-blockers) are used after ESWL. Does the patient need anesthesia? Yes, even though there is no incision, there will be pain. You and your doctor will discuss whether light sedation and local or general anesthetics will be used. The choice depends on the technique, the type of stone and the patient. ESWL can be delivered with just mild sedation, but in general, some type of anesthesia–either local, regional or general–is used to help the patient remain still, reduce any discomfort, and this improves the breaking of the stone. Does the patient need to be hospitalized? Not usually. In most cases, lithotripsy is done on an outpatient basis. What are the advantages and disadvantages of this treatment? The main advantage of this treatment is that it treats kidney stones without an incision. As a result, hospital stays and recovery time are reduced. But, while ESWL can work, it doesn’t always work. After ESWL, about 5O% of people will be stone free within a month. In others, stone fragments of various sizes remain. Sometimes a repeat procedure (or a different procedure) is needed. ESWL has the potential to cause kidney injury. Whether or not ESWL causes or leads to the development of high blood pressure and diabetes remains controversial. These possibilities are still being studied. You should ask your doctor about risks and benefits of SWL in your situation. What can the patient expect after treatment? The recovery time is usually fairly brief. After treatment, the patient can get up to walk almost at once, Many people can fully resume daily activities within one to two days. Special diets are not required, but drinking plenty of water helps the stone fragments pass. For several weeks, you may pass stone fragments. What will happen after I leave the hospital? After treatment, you will have blood in your urine and possibly abdominal pain or aching for several days. Other people experience a severe cramping pain as shattered stone fragments make their way out of the body. Oral pain medication and drinking lots of water will help relieve symptoms. Sometimes, the stone is not completely broken up, or big pieces remain and additional treatments may be needed. Rarely, more serious problems occur, such as bleeding near the kidney that might require a blood transfusion, damage to the area around the stone, or pieces of the stone blocking the flow of urine. Call your doctor if you feel the strong need to urinate even after you empty your bladder or if you are in extreme pain even when taking your pain medicine. How successful is shock wave lithotripsy? ln those patients who are thought to be good candidates for this treatment, some 50-75% are found to be free of stones within three months of ESWL treatment. The highest success rates seem to be in those patients with smaller stones (such as less than 1 cm). After treatment, some patients may still have stone fragments that are too large to be passed. These can be treated again if necessary with shock waves or with another treatment.